Competitive 20 page A4 booklet printing of full colour books printed and delivered to Ireland at very competitive prices. 20 page A4 booklet printing at great prices for next day delivery to Ireland. A4 20pp booklets printing onto 115 gsm gloss. art paper. Full colour two sided booklets printed onto 115 gsm gloss. art paper. 7 to 10 day print prices, based on supplied artwork. 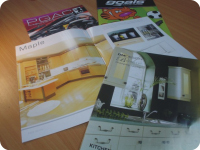 For a faster book making print service use our 3 to 5 day printing service. 3 to 5 day print prices, based on supplied artwork.